1 of 2 In a medium-size heavy-bottomed saucepan, whisk granulated sugar and cornstarch. Gradually add milk, whisking constantly to keep mixture from getting lumpy. 2 of 2 Transfer saucepan to stove, and heat over medium heat, stirring constantly with wooden spoon. Bring to a simmer, then add chocolate. Cook 3 minutes or until chocolate is melted. Stir in vanilla. Pour into a bowl; cover surface with plastic wrap. Refrigerate until cold, about 4 hours or overnight. 1 of 6 Heat oven to 350 degrees F. Coat two 8 x 2-inch round baking pans with nonstick cooking spray. Line bottoms with wax paper; spray paper. 2 of 6 Microwave chocolate and oil for 1 minute; stir until smooth. If needed, heat an additional 15 seconds. Cool slightly. 3 of 6 In medium-size bowl, mix flour, cocoa powder, baking powder, baking soda and salt. In large bowl, beat with mixer on medium speed the butter and sugars until well combined. Add eggs, one at a time, beating well after each. Beat in melted chocolate and vanilla. 4 of 6 On low speed, beat flour mixture into butter mixture, alternating with buttermilk, beginning and ending with flour. Spread into pans. 5 of 6 Bake at 350 degrees F. for 30 to 35 minutes or until toothpick inserted in centers tests clean. Cool cakes in pans on wire racks 15 minutes. Turn cakes out onto racks; cool layers completely. 6 of 6 Cut each cake layer in half horizontally for a total of 4 layers; crumble 1 cake layer into crumbs and set aside. Place 1 cake layer cut-side down on a serving platter. Spread with 1 heaping cup frosting and top with another cake layer. Repeat with 1 heaping cup frosting and last cake layer. Spread remaining frosting over top and sides of cake. 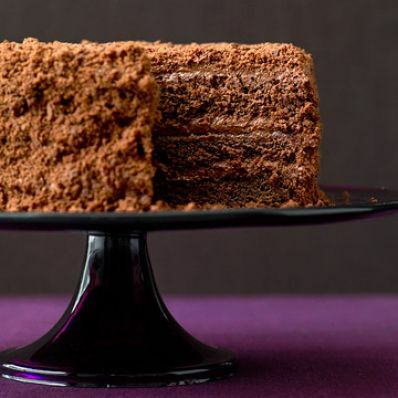 Sprinkle cake crumbs over top and side of cake, pressing gently to adhere.